I can't seem to stop wearing white and Turquoise lately. I just really love the combination for Spring. I love these Kendra Scott earring and my new Kendra Scott necklace. I have a couple of pairs of these earrings in different colors and I would say that they are a staple in my jewelry collection. They add the perfect pop of color to a lot of my outfits. And this necklace for me is just the perfect everyday necklace. Especially now with Andi it is hard for me to wear long necklaces or bigger statement necklaces. I literally have worn this everyday since I got it. In my opinion, adding colored jewelry to a neutral colored outfit or really any outfit is really what makes the outfit! Especially when like me you don't have time to wear your hair down! Throwing on a fun pair of earrings makes me feel more put together. Beautiful total white look. Love your cute jewelry! love the white! so chic! the earrings are amazing! I love the pop of turquoise! So pretty! Super look! Perfect for spring! Love your earrings! Lovely top and gorgeous earrings, love the color! I love this top and it is so pretty with the all white look. Absolutely love the white and turquoise!! Gorgeous and perfect for Spring! You look gorgeous in all white! The pops of turquoise add the perfect touch of color! 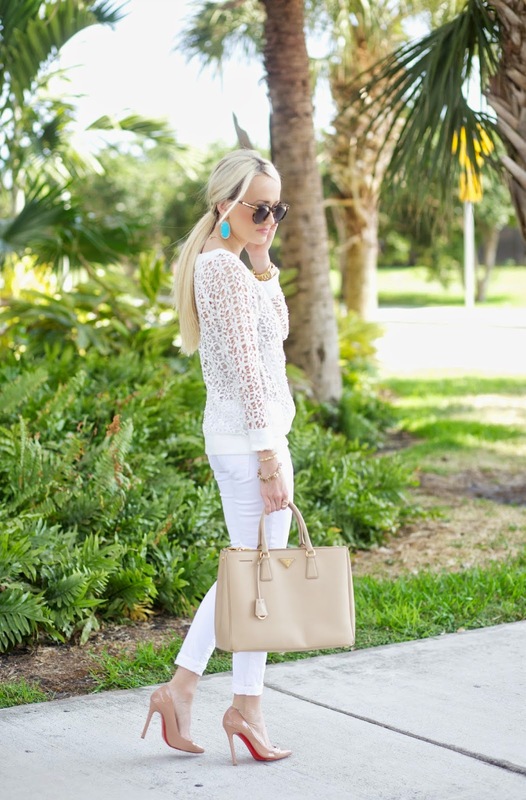 Very elegant and perfect for Spring, all white outfit! I like your top very much!! I love the neutrals-so gorgeous! And the pop of turquoise is just perfect. I wear my Kendra Scott earrings ALL the time. Totally obsessed with them. But I've been wanting to get the turquoise as well. You look beautiful! This is such a lovely all white look! I love the white with the pops of turquoise, so summery & fresh! Love that shirt! And the pop of turquoise looks stunning on you! Beautiful look! Love the top and blue jewelry. I love the neutral look. Thanks for the inspiration. Very pretty lace sweatshirt and the pops of turquoise and gold from the accessories are really lovely! Beautiful look! Very slimming look! Beautiful for spring! Looking gorgeous! Absolutely love this outfit!